Since 1946 the name HAZEMAG has been linked with many accomplishments in impactor design and control technology. Today's impactor is different. It's better. It's more user friendly, and it's easier and less expensive to maintain. It offers optimum and continuous control over product size, and can do much more. In fact today's impactor, the Hazemag Impactor, can do things never before possible. With over 50 years of experience in design and application of impactors, the future of impacting technology is now here. HAZEMAG USA INC. P.O. BOX 1064 Uniontown, PA 15401 Phone: 724.439.3512 Fax: 724.439.3514 E-mail: info@hazemag.com HAZEMAG CANADA INC. 1 Marconi Court, Unit #10 Bolton, ON L7E 1E2 Phone: 905.857.9623 Fax: 905.857.3025 E-mail: info@hazemag.ca ROCK CRUSHING AT ITS FINEST. ENGINEERED TO BE DEPENDABLE AND RELIABLE. 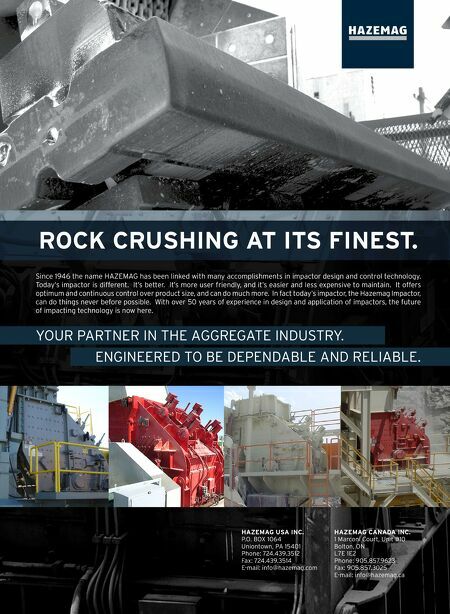 YOUR PARTNER IN THE AGGREGATE INDUSTRY.